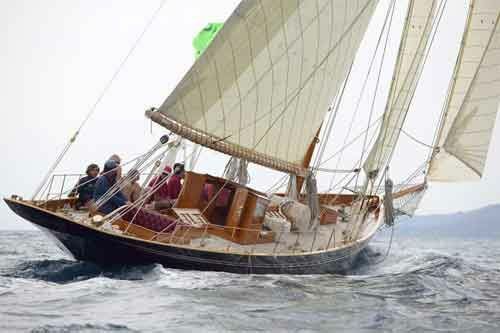 She sails for the first time in 1909 with the name of White Heather under the direction of Harter Kirkland Glazbrook, a sailor from Liverpool. The Varuna is built according to the international rules for the category of 12 M, but she is conceived as an assistant yacht rather than a race one, as shown by her lines and her long Dog-House. It has always been said she was a half-scale replica of the Britain, the famous yacht belonging to the English crown, and it is so true that in Cowes she was called Little Britain. In 1928, the boat was acquired by the Commander William Lidswell and she was renamed. From that moment it was known as Varuna, the Indian goddess of the waters and the seas. From 1928 to 1978, the Varuna belonged to the same family and was used for cruises in the East coast of Scotland. In 1979 she was sold to a company that rented her, but four years later, due to the owners’ bankruptcy, the Varuna is left moored in the Italian town of Canterieri di Imperia. Finally, in 1999 Luigi Donna buys her, and he remodels and relaunches her to the sea on the 25th of May 2002.